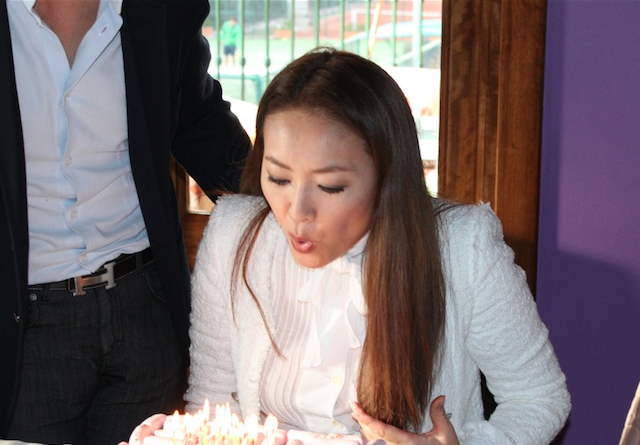 The beautiful Saeko Hamada from Coastlifed projects celebrated her Birthday with close friends this year in Manolo Santana Tennis Club. i-Marbella also asked Saeko, how does she feel about this important day and what is her secret of looking so young and gorgeous! 1. How do you feel about Birthdays and ageing? What does it mean to you? I was a weak child and have seen many children die in hospital as I grew up. So each year, when I have my birthday I feel so lucky to have be healthy! 2. How did you celebrate your Birthday this year? My friend Tiara organised Surprise Birthday Lunch with girls for me. And we had another Birthday lunch at Manolo Santana Racquets Club, which continued until 22:00 and we ended up having also dinner together. And finally we will have a Japanese Birthday Dinner with some friends. 3.What has been the most memorable present that you have been given for your Birthday? A gift from my husband. 4.What traditions do you have in Japan for Birthdays? Same with Europe. Many people have parties with family and friends. It is an important event for everyone. 5.You look amazing! What is your beauty secret for looking so fresh and young? I think just trying to be positive and I always trying new things. Keeping yourself interested in many things and never being lazy is important and also to be happy with my life. And I always remember how lucky I am to have my family and friends. My life is quite simple to be honest.